This is an elegant traditional outfit for kids; perfect for weddings, birthdays or any other formal event!Green/Black readymade Jodhpuri sherwani kurta suit for boys in soft silk. 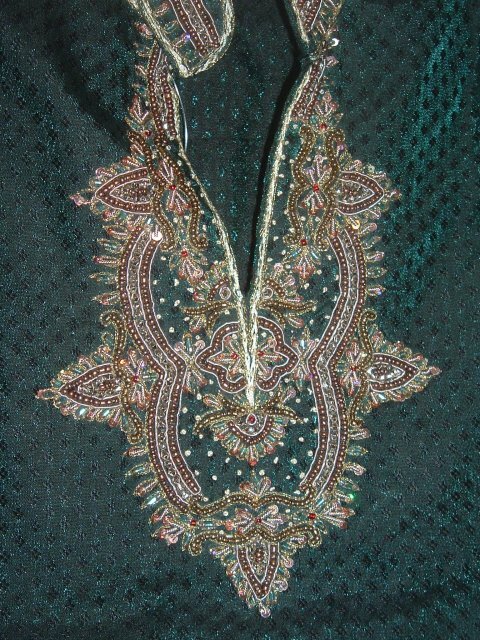 The green kurta is embossed all over with diamond-shapes. It is beautifully adorned at the neck with beads, sequins and gold thread. The churidar / pajama is cream colored. Available for kids 4 year old and up. 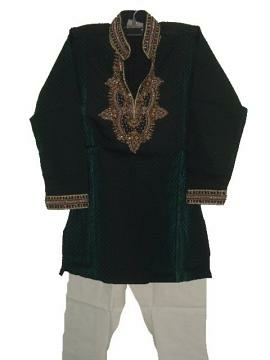 This item in Kurta Pajama for Kids category was first added to our catalog on 09-27-2011. Buy Boys Sherwani Suit, Jodhpuri Kurta Churidar In Green & Black, sold & shipped by desiVastra.com where you can shop online for Traditional Dress for Baby Boy & Girl, Indian ethnic Wear for Kids. This Kurta Pajama collection has been tagged as Jodhpuri, Party Wear Sherwani, Traditional Kurta Churidar, Festival Shopping, Party Wear, Indian Clothing, Kids Wear.